A nineteen-month-old girl was taken up for patent ductus arteriosus (PDA) device closure. A diagnostic catheter from the right femoral venous access entered the superior vena cava (SVC), through the azygos vein suggesting interruption of inferior vena caval with azygos continuity. Therefore, the PDA device was closed from the right jugular venous access. However, a postprocedure echocardiogram (echo) showed a patent inferior vena caval connection into the right atrium. An angiogram from femoral veins showed communication between the iliac veins and the azygos system, in addition to normal drainage into the inferior vena cava (IVC). Congenital communication between the iliac veins and the azygos system can mimic IVC interruption. An attempt to theoretically explain the embryological origin of the communication has been made. We report a venous system abnormality mimicking inferior venacava (IVC) interruption, in a case of patent ductus arteriosus undergoing device closure. A nineteen-months-old girl presented with recurrent respiratory infection and patent ductus arteriosus (PDA). There was no other significant past medical or surgical history. An echocardiogram showed a 3.4 mm PDA with adequate ampulla and mild hyperkinetic pulmonary arterial hypertension. The patient was taken up for percutaneous device closure of the PDA. 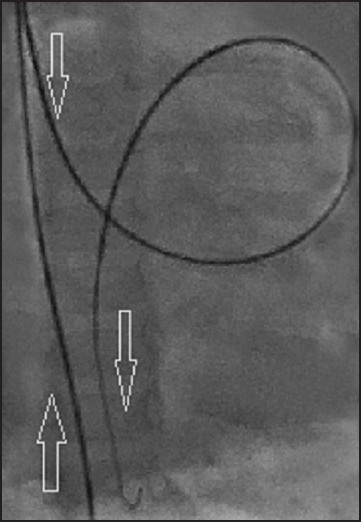 A diagnostic catheter (5 F Goodale Goodale-Lubin) from the right femoral venous access entered the right atrium through azygos vein into superior vena cava (SVC). A diagnosis of IVC interruption with azygos continuity was made. The PDA was crossed from venous end. The catheter course was via the right femoral vein, azygos vein, SVC, right atrium (RA), right ventricle, pulmonary artery, PDA to the descending aorta [Figure 1]. In view of the tortuous course, difficulty in tracking the delivery sheath was anticipated. Interventional options available in such a situation are: (a) Arterial side snaring of the distal end of the wire (for support), and tracking the femoral venous sheath, (b) Jugular venous approach, and (c) Trans arterial Amplatzer duct occluder II (ADO II). An ADO II device of appropriate size was not available then in the catheterization laboratory. Arterial side snaring was not attempted, anticipating cardiac stretch-related bradycardia. Therefore, the right internal jugular vein (IJV) access was used for PDA closure. 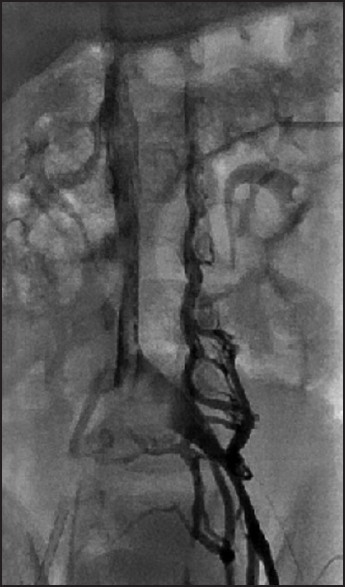 An aortogram from the femoral arterial access showed 4.7 mm PDA. Through an 8F Mullin sheath, in the right internal jugular vein access, a 10 × 12 mm Heartr™ duct occluder device (Lifetech Scientific Inc., Shenzhen, China) was deployed. The post procedure angiogram and echo showed stable device position, with no residual flow. On the following day, a repeat echocardiogram revealed patent IVC connection into the right atrium. The patient was taken up for a venogram to rule out interrupted IVC. 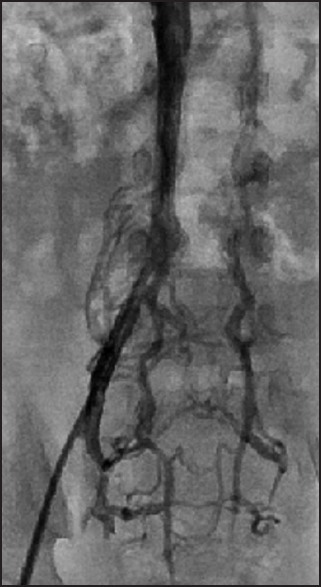 A right femoral venous angiogram showed filling of the iliac veins and azygos system, in addition to normal drainage into the IVC [Figure 2] and [Figure 3], [Video 1]. 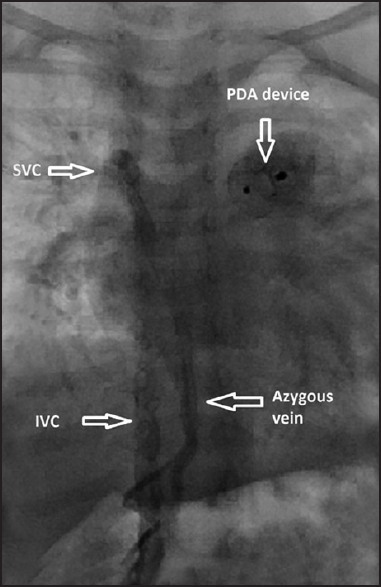 Similarly, the left femoral venous angiogram showed filling of both the IVC and the hemi azygos system [Figure 4], [Video 2]. Hence, the misdiagnosis of IVC interruption was revealed. The catheter has had tracked through the congenital communication between the iliac veins and the azygos system, bypassing the IVC. Had it been recognized earlier, internal jugular vein (IJV) access could have been avoided. Anomalies in the IVC occur in 0.3% of otherwise healthy individuals and in 0.6-2% of patients with other cardiovascular defects. Absence of the hepatic segment of IVC with azygos continuation into the right or left SVC is referred to as an interrupted IVC. It is recognized by failure to enter the RA through IVC, from femoral venous access. Although mostly associated with polysplenia (bilateral left atrial isomerism), it can also occur without major congenital heart disease also. It can be associated with procedural difficulties during electrophysiological studies, right heart catheterization, cardiopulmonary bypass surgery, IVC filter placement, and temporary pacing. The azygos vein commences from the right lumbar or the right renal vein and passes through the aortic opening of the diaphragm to enter the thorax. It receives the lower ten right intercostals veins. At the level of the fourth thoracic vertebra, it arches anteriorly to connect with the posterior surface of the SVC. The hemiazygos system on the left side drains into the azygos vein, at the level of T9. Developmentally, IVC is formed by five embryonic structures during the sixth to eighth gestational weeks as shown in [Table 1] (above downward). , The hepatocardiac channel, which is a derivative of the right vitelline vein after the hepatic parenchyma develops, forms the suprahepatic portion of the IVC. The hepatic portion of the IVC is formed by the anastomosis between the right subcardinal vein and the hepatocardiac channel. The renal portion of the IVC is formed from the right subcardinal vein, from the mesonephros. The infrarenal segment of the IVC develops from the anastomosis between the subcardinal and right sacrocardinal veins. The most caudal parts of the IVC and iliac veins develop from the sacrocardinal veins. The azygos and hemiazygos systems develop from supracardinal veins on right and left sides, respectively. Communications do exist between the various portions of the supracardinal veins (azygos) and different parts of the venous channels that eventually form the IVC. Failure of connection between the renal and hepatic segments results in IVC interruption. Congenital communication between the iliac and azygos veins may represent embryological communication between the sacrocardinal veins and supracardinal veins. This variation in the venous anatomy is highlighted to make readers aware of the potential overdiagnosis of IVC interruption when the catheter course from the right femoral vein is abnormal. Readers should be aware of these communications and manipulate the venous catheter to enter the main channel of the IVC and away from these smaller venous communications, during catheterization. Congenital communication between the iliac veins and the azygos system can mimic IVC interruption. Diagnosis of IVC interruption needs confirmation by an echocardiogram and angiogram, especially in the absence of left isomerism. 1. Phillips E. Embryology, normal anatomy, and anomalies. In Venography of the inferior vena cava and its branches. Ferris EJ, Hipona FA, Kahn PC, Phillips E, Shapiro JH, editors. Baltimore, MD: Williams and Wilkins; 1969. p. 1-32. 2. Bass JE, Redwine MD, Kramer LA, Huynh PT, Harris JH Jr. Spectrum of congenital anomalies of the inferior vena cava: Cross-sectional imaging findings. Radiographics 2000;20:639-52. 3. Smallhorn JF, Anderson RH. Anomalous systemic venous return. In: Anderson RH, Baker EJ, Penny D, Redington AN, Rigby ML, Wernovsky G, editors. Pediatric Cardiology, 3 rd ed. New York: Churchill Livingstone; 2010. p. 487. 4. Sadler TW, editor. Langman's Medical Embryology, 9 th ed. Philadelphia: Lippincott Williams and Wilkins; 2004. p. 264-6. 5. Minniti S, Visentini S, Procacci C. Congenital anomalies of the venae cavae: Embryological origin, imaging features and report of three new variants. Eur Radiol 2002;12:2040-55.